Talk: What is good and bad art? HERE&NOW18: Besides, it is always the others who die presents new works from Western Australian artists Dr Perdita Phillips, Dr Alex Spremberg, Carly Lynch, Peter & Molly, Julie Dowling, and Bjoern Rainer-Adamson that respond to the challenge of contemporary art set by Marcel Duchamp 100 years ago. The year 2018 marks the 50th anniversary of Duchamp’s death, as well as 50 years since the Marcel Duchamp: The Mary Sisler Collection exhibition of his work, which toured to the Art Gallery of Western Australia in 1968. To mark the occasion, HERE&NOW18: Besides, it is always the others who die curated by Anna Louise Richardson offers a contemporary engagement with the iconoclastic technical, social, and cultural legacy of Duchamp through themes of duality, process and disruption - while participating in a reflective dialogue with a private collection of Marcel Duchamp artworks and ephemera. 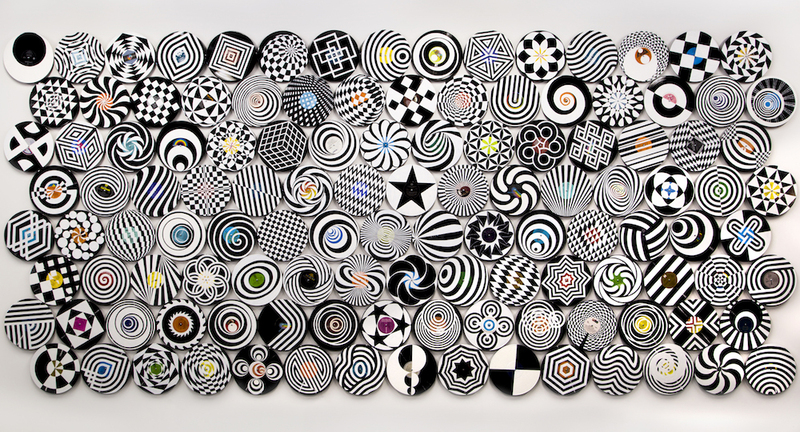 Image: Alex Spremberg, The Sound of White, Even (detail), 2017-2018, enamel on vinyl records, 2150mm x 4730 mm. © Courtesy of the artist. Delve deeper into the fascinating world of Duchamp in the exhibition catalogue HERE&NOW18: Besides, it is always the others who die. Celebrating the exhibition of the same name currently on show at LWAG, and commemorating 50 years since Duchamp's death, we are sure you will enjoy this collection of essays by prominent art historians, curators and commentators. Essays by: Megan Hyde, Monique Fong, T.D. Picton-Warlow, Marcus Moore, Lara Nicholls, Robert Cook, Clothilde Bullen, Josephine Wilson, Tulleah Pearce, Bec Dean, Leigh Robb, Ross Rudesch Harley and Anna Richardson. 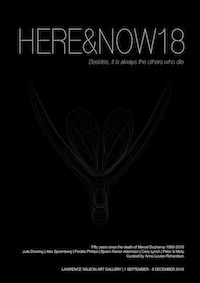 HERE&NOW18: Besides, it is always the others who die has been made possible through the support of the Australian Government through the Australia Council, its arts funding and advisory body. Special thanks also to Jones Day, The Circulating Film and Video Library - The Museum of Modern Art, The University of Western Australian Art Collection, the Art Gallery of New South Wales, T.D Picton-Warlow & J.J. Robson Collection, the Art Gallery of South Australia, the Queensland Art Gallery, Francis Norman, the State Records Office of Western Australia, and the Auckland Art Gallery Toi o Tamaki.